Offa was King of Mercia, a kingdom of Anglo-Saxon England, from 757 until his death in July 796. The son of Thingfrith and a descendant of Eowa, Offa came to the throne after a period of civil war following the assassination of Æthelbald. Offa was frequently in conflict with the various Welsh kingdoms. There was a battle between the Mercians and the Welsh at Hereford in 760, and Offa is recorded as campaigning against the Welsh in 778, 784 and 796 in the 10th century Annales Cambriae. The best known relic associated with Offa’s time is Offa’s Dyke, a great earthen barrier that runs approximately along the border between England and Wales. It is mentioned by the monk Asser in his biography of Alfred the Great: “a certain vigorous king called Offa … had a great dyke built between Wales and Mercia from sea to sea”. Despite Asser’s comment that the dyke ran “from sea to sea”, it is now thought that the original structure only covered about two-thirds of the length of the border: in the north it ends near Llanfynydd, five miles (8 km) from the coast, while in the south it stops at Rushock Hill, near Kington in Herefordshire, fifty miles (80 km) from the Bristol Channel. The total length of this section is about 64 miles (103 km). Other earthworks exist along the Welsh border, of which Wat’s Dyke is one of the largest, but it is not possible to date them relative to each other and so it cannot be determined whether Offa’s Dyke was a copy of or the inspiration for Wat’s Dyke. The construction of the dyke suggests that it was built to create an effective barrier and to command views into Wales. This implies that the Mercians who built it were free to choose the best location for the dyke. There are settlements to the west of the dyke that have names that imply they were English by the 8th century, so it may be that in choosing the location of the barrier the Mercians were consciously surrendering some territory to the native Britons. Alternatively it may be that these settlements had already been retaken by the Welsh, implying a defensive role for the barrier. The effort and expense that must have gone into building the dyke are impressive, and suggest that the king who had it built (whether Offa or someone else) had considerable resources at his disposal. 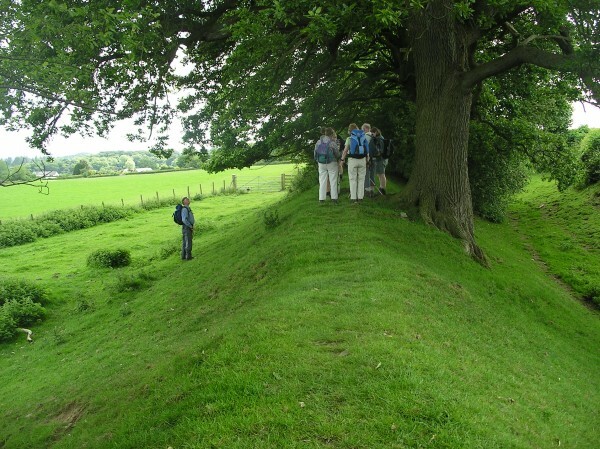 The Dyke, which was up to 65 feet (20 m) wide (including its flanking ditch) and 8 feet (2.4 m) high, traversed low ground, hills and rivers. Today the earthwork is protected as a scheduled monument. Some of its route is followed by the Offa’s Dyke Path; a 176 mile (283 km) long-distance footpath that runs between Liverpool Bay in the north and the Severn Estuary in the south.